We’ll be pulling tickets for the teen prizes all summer long! Below you will find a schedule of what prizes will be presented when, so that you can get your tickets to the prize you’re aiming for! All tickets will be pulled between 6 and 7pm and winners will be contacted by phone. If you have any questions don’t hesitate to ask! We have some amazing prizes for this summer’s reading challenge! For students entering 7th – 12th grade the prize system works a little differently. For every hour you read you will receive a ticket which you can put in a can with a number on it. Each of these cans has a number corresponding with one of our prizes. Prizes include passes to a trampoline park, tickets to a baseball game, free ice cream sundaes, amazon gift cards, and more! 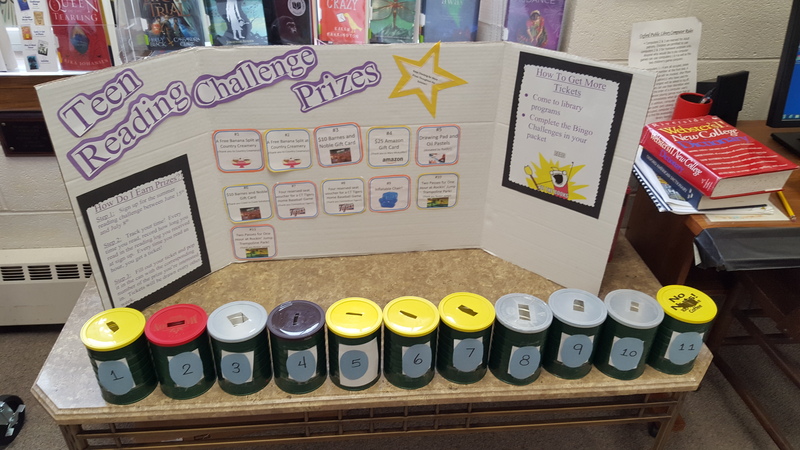 You can earn even more tickets to enter for prizes by coming to programs, completing mini-challenges, and reading more! You can sign up for the summer reading challenge from June 15th – July 8th! Call or visit the library to find out more! Hi guys! Spring is here and I hope you’re all having a blast. Here are some upcoming programs I hope you’ll enjoy. If you want to come to any just throw me an email at rrivero@oxfordlib.org or call at (203) 888-6944. The Junior Friends group plays an active role in planning programs, fundraisers, and making the library a better place! During April’s meetings we will be working on our upcoming fundraisers! We’ll be creating signs for our upcoming bottle and can drive as well as making some bracelets to raise money to sponsor programs for our Summer Reading Program! Come test your knowledge about Hogwarts, the wizarding world, and the Boy Who Lived! Do you love Science Fiction? So do I! If you’re into the genre or just looking for an interesting read, come join us to talk about some classic Sci Fi short stories! If you would like to join, please sign up and ask Miss Robyn for a copy of the stories! In honor of “Drop Everything and Read” month, we will be hosting a 2 hour all ages “read-in!” Bring a book or borrow one, stay for a little or a lot, but be sure to make time, even for a moment, to drop everything and read! The authors of the book The Secret Files of Fairday Morrow will be visiting! They will be discussing the inspiration and process of writing a book and share tips and answer questions! The book has a 780 lexile reading level and is suggested for readers 10 and up. However, aspiring writers of any age would enjoy this program! Come share your writing, songs, or anything else you can think of! This is a supportive and positive environment to show off all of the things that make you awesome! April 28th is “Great Poetry Day!” Come share your great poetry with other poetry lovers! Not a writer? Feel free to share your favorite poems written by an author! Are you a pro at knowing unique facts? Do people often ask, “How did you know that? !” Come to Teen Trivia and test your knowledge! I know how busy this time of year is, but in the hopes of giving you something fun to do to unwind, I’ve planned some (what I hope) are super exciting upcoming programs! March 10th I’ll be hosting a “Teen Tech Trivia” night in honor of Teen Tech week. I’ll have a bunch of books available for you guys to “complete” and if you do take photos make sure to put them on our facebook wall or use #bookfacefriday #TTW16 on Instagram and geotag us! In addition to program descriptions, I also wanted to let you know that my director and I visited the American Library Association Exhibition a few weeks ago and we have tons of books that we’ve brought back that are not yet available to the public! The YA material in particular looks great! You can win one of these books by stopping in and guessing how many chocolate kisses we have in a jar on our circ desk! Also, I’ve added lots and lots of new YA books to our high school collection so be sure to stop in to check out the new titles! Here are some upcoming February programs to look forward to! If you want to sign up for a program or have any questions you can stop in, call us at (203) 888-6944, or e-mail me at rrivero@oxfordlib.org. Hope to see you soon! Make new friends, learn the game, or test new strategies. All ages and skill levels are welcome. This is one of our fastest growing programs so we encourage registration for this event each week to aid with partner match ups, however, drop in guests are always welcome! We will be creating cool sculptures out of yarn that can be mounted on your wall or hung up. Our craft table will be filled with everything you need to create Valentines for the special people in your life! Drop by any time between 12:00 and 4:00 to make a Valentine! Can you make a pyramid using 36 cups? Can you move a cookie from your forehead to your mouth without using your hands? Can you balance six dice on a craft stick? If you said yes to any or all of these questions, ask yourself this; can you do it in under 60 seconds? Come to teen night at the library to find out! We’ll be trying out all these different challenges and more while competing against others and the clock to win bragging rights and some cool prizes.